56-911 (c/n 1199) This Starfighter arrived according documents at Da Nang in September 1965. We believe it came from CCK AB (Taiwan) that day where it had received overhaul. On September 20th, 1965 the aircraft was lost in an accident at Da Nang Air Base. 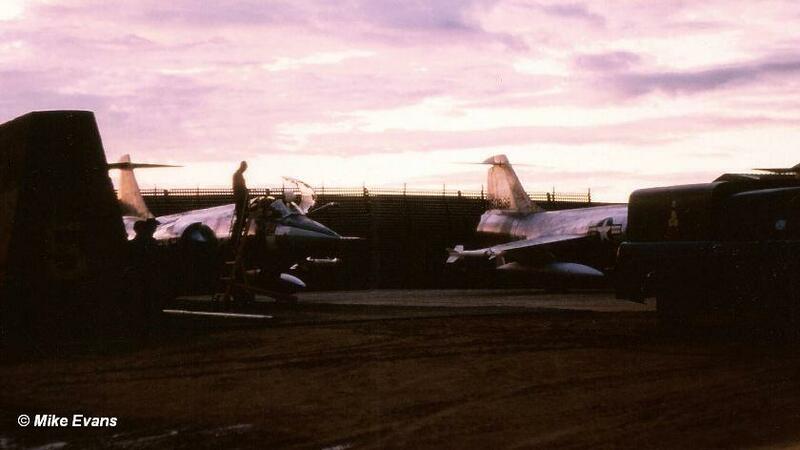 It happened after a search & rescue operation to find their shot down colleague Phil Smith (F-104C 56-883). The aircraft collided with the 2nd F104C 57-921 on the approach to Da Nang. The aircraft was piloted by Capt. Harvey Quackenbush (436TFS) while the other aircraft was piloted by and Capt. Dayle W. Carlson. The aircraft and pilots landed in Da Nang Bay approximately 6 miles north of Da Nang AB. Both aircraft had been launched on a RESCAP mission after Capt Phillip Smith had been shot down by a Chinese MiG-19 over Hainan Island. They took off at 1707 hours Local. The two aircraft remained in the search area for 45 minutes, refuelled from a C-130 tanker, then returned to the SAR area. The search was terminated at 1930 hours. Letdown to land at Da Nang AB was made through overcast and both aircraft flew minimum AB with speed brakes to burn down heavy fuel loads. They had been flying around the area for a long time and it had become dark when returning base. The lights were not operational (They didn't really need to be since their missions were day only) and were inbound for landing when one lost track of the other. A right turn was made at approx 10,000’ aligning with Runway 1 at Da Nang. The other pilot was requested to light his afterburner so that he could find the other during the dark circumstances. When this was done it was found that the other was in very close in front and slightly above. The afterburner lightning was done too late to avoid the collision. The aircraft became uncontrollable and both pilots safely ejected. Both pilots were rescued by naval patrol boat. Both aircraft crashed into the bay and were not recovered. 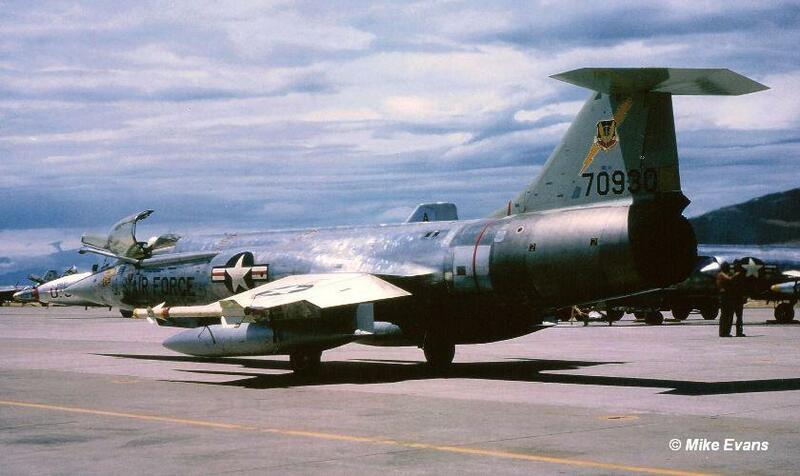 56-912 (c/n 1200) This Starfighter was seen at Da Nang AB in 1965 as “60912”. No specific information about this aircraft at Da Nang AB is available. See photo showing this aircraft beneath with 56-928 history. 56-922 (c/n 1210) This Starfighter was seen at Da Nang AB in November 1965 as. No specific information about this aircraft at Da Nang AB is available. 56-928 (c/n 1216) This Starfighter was seen at Da Nang AB in November 1965 as. No specific information about this aircraft at Da Nang AB is available. Beneath a photo showing 56-928 together with 56-912 on Mig cap patrol mission. 56-929 (c/n 1217) This Starfighter was seen at Da Nang AB in 1965. In December 1965 it was seen arriving at McClellan Air Base, likely to receive IRAN. 56-932 (c/n 1220) This Starfighter was seen at Da Nang AB in 1965. No specific information about this aircraft at Da Nang AB is available. 56-933 (c/n 1221) This Starfighter was seen at Da Nang AB in 1965. Sadly no specific information about this aircraft at Da Nang AB is available. 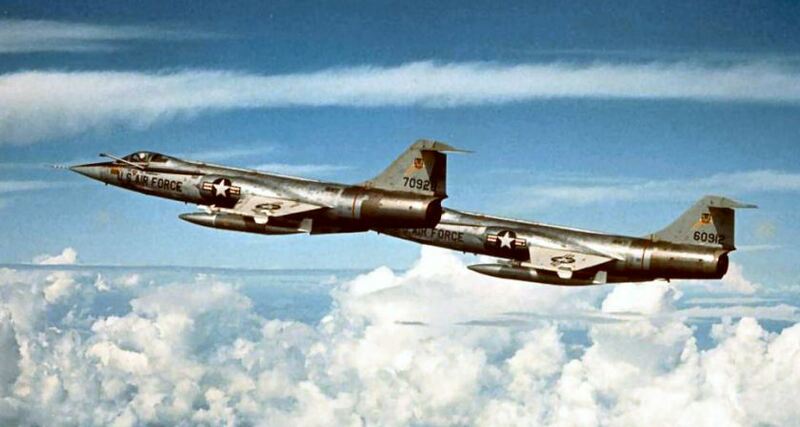 Beneath a photo provided by Bob Lilac who flew the F-104 at Da Nang. 56-936 (c/n 1224) This Starfighter was seen at Da Nang AB where it arrived on September 24th, 1965 likely from CCK AB, Taiwan where it had been for overhaul. On November 22nd, 1965 it left Da Nang for CCK AB again for another overhaul cycle. Finally it arrived at George AFB, USA, on December 18th, 1965. Beneath a photo showing the aircraft on patrol with 56-910, refuelled by KB-50D. (Thanks to Ray Pamplin). 56-937 (c/n 1225) This Starfighter was seen at Da Nang AB early June 1965. 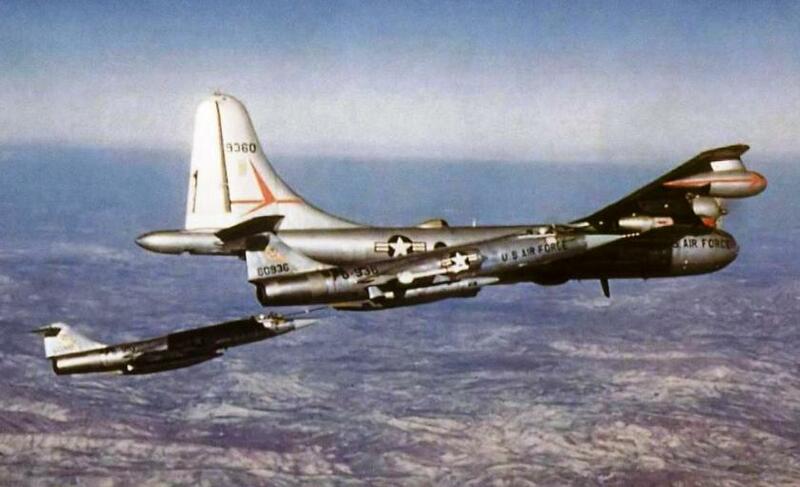 Later that month, June 29th, it crashed 100nm South/Soutwest of Da Nang Air Base after being shot down by Anti-Aircraft-Artillery ground fire. It happened during a bomb/strafe attack with 2/M117 750# bombs, and 750rds of 20mm. The pilot Capt. Richard R. Cole could eject and was rescued with minor injuries. Note: Some believe it was not shot down but the pilot lost control during a pitch up at roll in on the dive pass. 56-938 (c/n 1226) This Starfighter was seen at Da Nang in 1965. On October, 18th, 1965 it encountered an accident at DaNang AB but was repaired soon. Pilot Capt Morgan Lilly was Nr.2 in a 4 ship taking off at 1440 LT for a combat mission. On return the weather was marginal with a visibility of 1½-2 miles in rain and drizzle. The approach was discontinued due to a position unsafe for landing. Nr.1 stayed unplanned below the clouds and landed. Nr.2 was unable to follow and returned to GCA. The approach and landing were ok, but 3,800 feet down the Rwy the aircraft departed the concrete on the left side, causing the right main gear to collapse. This caused the aircraft to return onto the Rwy and it stopped after 5,000 feet. Capt Lilly shut down the engine and left the aircraft unhurt. 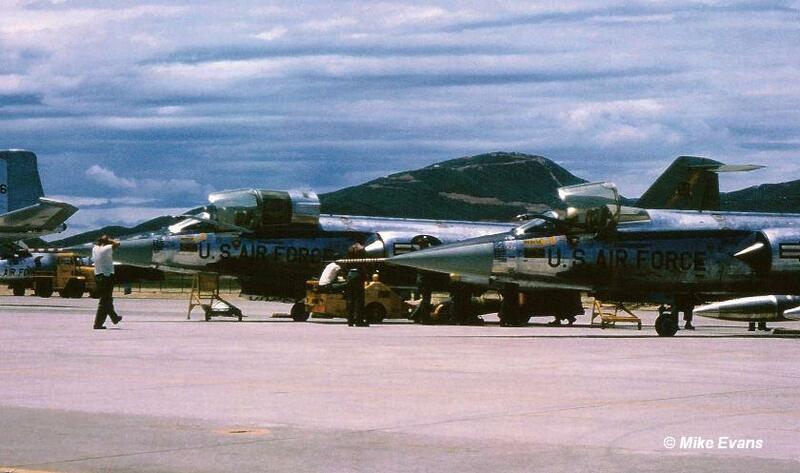 57-910 (c/n 1227) This Starfighter should have been seen at Da Nang AB in 1965 but has not yet been confirmed. At least it was seen once at CCK AB but that is not a surprise. 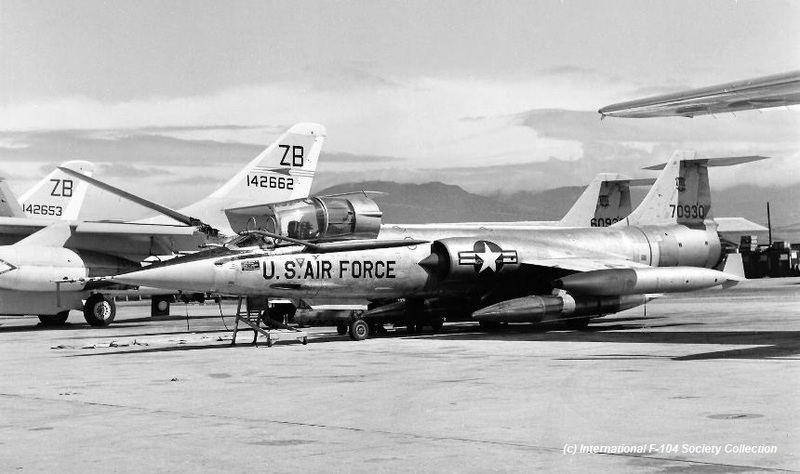 57-911 (c/n 1228) This Starfighter was seen at Da Nang AB in 1965. No specific information about this aircraft at Da Nang AB is available. 57-914 (c/n 1231) This Starfighter was seen at Da Nang AB in 1965. No specific information about this aircraft at Da Nang AB is available. 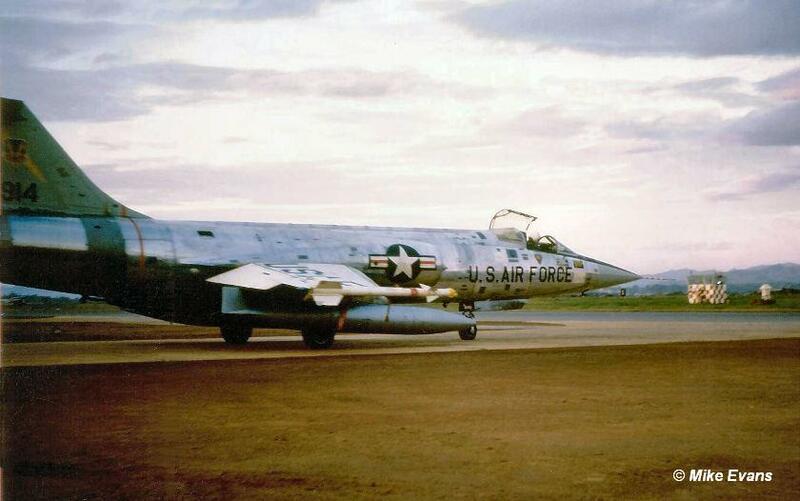 57-916 (c/n 1233) This Starfighter was seen at Da Nang AB in 1965. On November, 26th, 1965 it was seen at CCK AB, Taiwan where the aircraft stayed for an overhaul cycle. 57-921 (c/n 1238) This Starfighter was seen at Da Nang AB in 1965 and on September 20th, 1965 the aircraft was lost in an accident at Da Nang Air Base. It happened after a search & rescue operation to find their shot down colleague Phil Smith (F-104C 56-883). The aircraft collided with the 2nd F104C 56-911 on the approach to Da Nang. The aircraft was piloted by Capt Dale Carlson (436TFS) while the other aircraft was piloted by and Capt. Harvey Quackenbush. The aircraft and pilots landed in Da Nang Bay approximately 6 miles north of Da Nang AB. Both aircraft had been launched on a RESCAP mission after Capt Phillip Smith had been shot down by a Chinese MiG-19 over Hainan Island. They took off at 1707 hours Local. The two aircraft remained in the search area for 45 minutes, refuelled from a C-130 tanker, then returned to the SAR area. The search was terminated at 1930 hours. Letdown to land at Da Nang AB was made through overcast and both aircraft flew minimum AB with speed brakes to burn down heavy fuel loads. They had been flying around the area for a long time and it had become dark when returning base. The lights were not operational (They didn't really need to be since their missions were day only) and were inbound for landing when one lost track of the other. A right turn was made at approx 10,000’ aligning with Runway 1 at Da Nang. The other pilot was requested to light his afterburner so that he could find the other during the dark circumstances. When this was done it was found that the other was in very close in front and slightly above. The afterburner lightning was done too late to avoid the collision. The aircraft became uncontrollable and both pilots safely ejected. Both pilots were rescued by naval patrol boat. Both aircraft crashed into the bay and were not recovered. 57-922 (c/n 1239) This Starfighter was seen at Da Nang AB in September 1965. In November 1965 it was seen at CCK AB, Taiwan where it received overhaul. In December it returned to George AFB, USA. 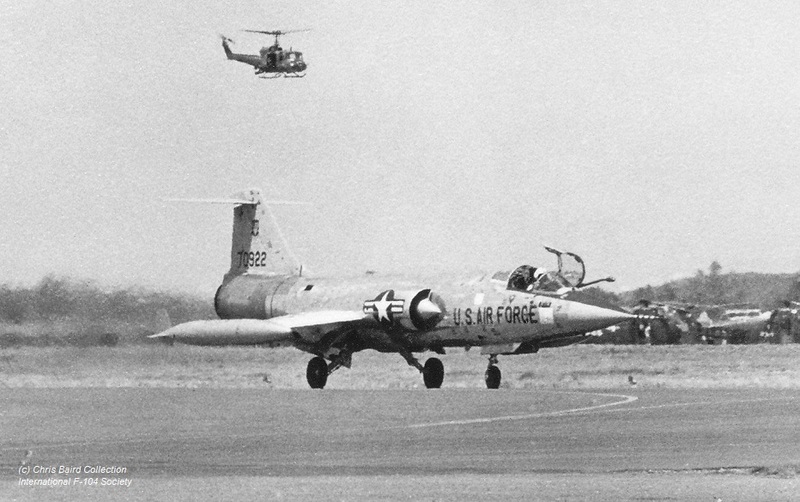 The photo beneath shows this Starfighter landing after a mission in 1965 at Da Nang (Chris Baird Collection). 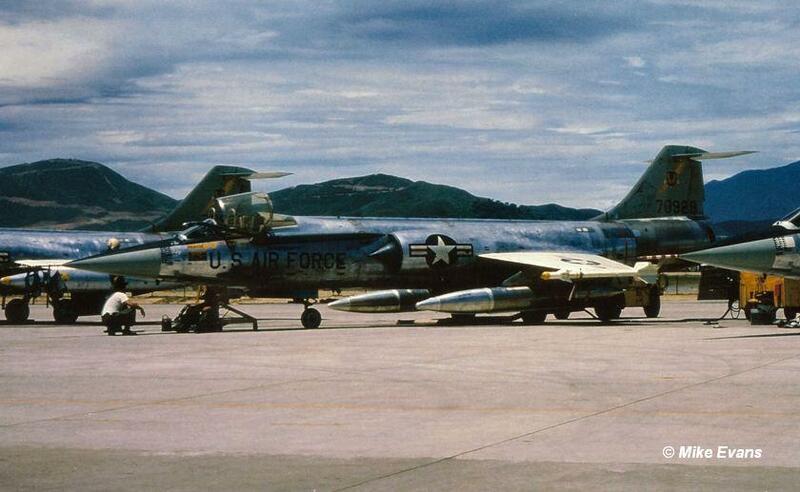 57-927 (c/n 1244) This Starfighter was seen at Da Nang AB in 1965. No specific information about this aircraft at Da Nang AB is available. 57-928 (c/n 1245) This Starfighter was seen at Da Nang AB in 1965. In September 1965 it was seen at CCK AB, Taiwan, receiving overhaul, and in October it arrived back at Da Nang AB. Finally itarrived at George AFB, USA, on December 18th, 1965. 57-929 (c/n 1246) This Starfighter was seen at Da Nang AB in 1965. 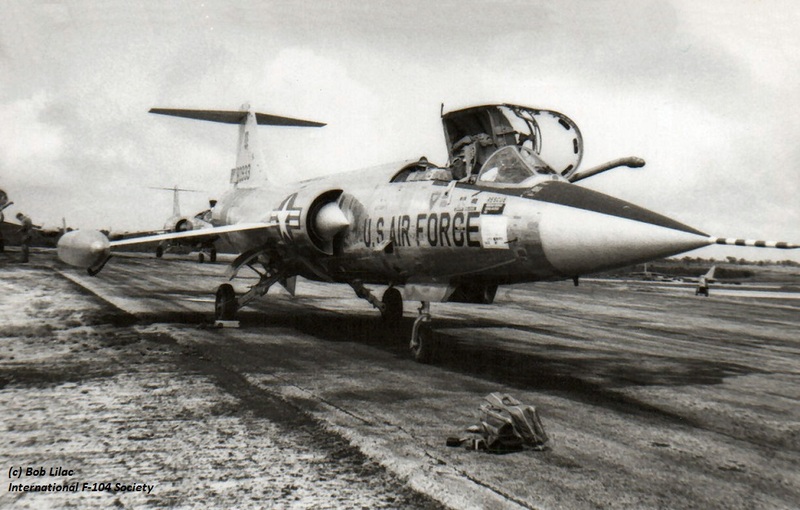 At the end of the deployment it carried a nickname in red on its nose... looking like a name starting with "Happy"..
57-930 (c/n 1247) This Starfighter was seen at Da Nang AB in 1965 and was one of a few aircraft which received a nickname painted on its fuselage. It was decorated with the name “BETSY”.